Well, I finally got back home last weekend. While gone, Clemson received record amounts of rain, and experienced a lot of flooding. Our vegetable garden fared better than expected, but not spectacularly. The weeds were even more impressed by the abundance of moisture. At least we didn’t experience any flooding in the house, though. Our local botanical garden did not do well at all, and has significant (and costly) damage. Getting back, I had a couple of things to check on. First was my brown ale, started and left to finish in my absence. Second was the garden. Then, there were my batches in secondary ferment. In between those came an opportunity to go berry picking at The Happy Berry, which spawned a number of new batches (excited!). The brown ale was quite done fermenting when I got back. So Wednesday (July 25th), I began the process of bottling the brown ale. I knew there was between 4 and 5 gallons of ale, but there as a lot of trub beneath that to be avoided. I didn’t really want to use a fermentation bucket for bottling, and didn’t have a 5 gallon carboy, so decided to use a 3G carboy, and then do the rest in a second step (not being sure how much it was even). Racking into the 3 gallon carboy was uneventful, and I checked the SG, finding it at 1.004. In short, excellent. The flavor was dry, as expected, and one of the most notable elements was the hops. The Amarillo finishing hops imparted a very distinct lemon-like flavor. I primed with just under a half cup of sugar (boiled with 1 cup of water), and then set to bottling. I bottled 32 bottles from the three gallons, plus a half bottle finished with the next racking. The next racking sucked in a little more material than intended, but it was a solid 2 gallons. Judging by eye, something I am not good at when it comes to sizing), I had guessed 1 gallon or maybe one and a half. But I was pleased with the 2 gallons. I miscalculated in my head, using nearly another half a cup (broken into two 1/4 cup additions). Math error between 3 and 2. Ugh. So hopefully the slight amount of additional sugar will not yield any blown bottles. It isn’t a whole bunch more, but it is more. That yielded another 22 bottles (plus the half, and enough to make a small glass for drinking while labeling). 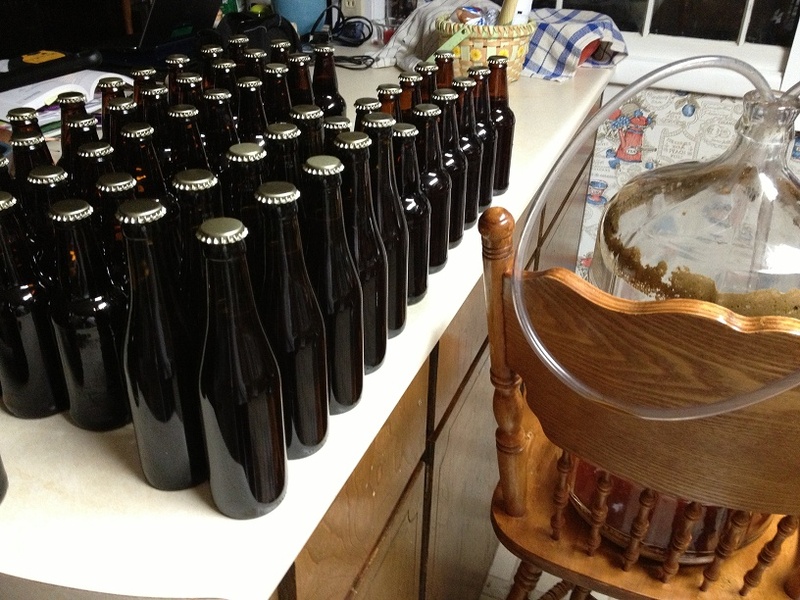 In total that made 55 bottles – about 10 of those being 11.2 ounce bottles, the rest 12 ounce. I calculated the ABV based on start and finish gravities at 4.33% ABV, and labeled as 4.3%. As usual, now we wait – I’m guessing at least four weeks. That being said, Monday after getting back (July 22nd), I tried one of the crown-capped bottles of mead I made before leaving on vacation. It had been about 4 weeks, so I was hopeful. On popping the cap, it came off without much resistance. The taste was fine, a little nutty and definitely mead (honey!). But it was lacking in carbonation. There was the slightest of tickle on the tongue. I imagine that either means the alcohol was too much for the yeast, there were already too few healthy yeast for the job, the honey used to prime takes longer than the 3-4 weeks to bring a noticeable level of carbonation, or this particular bottle was not sealed well enough to hold the charge. I’ll wait a couple more weeks before sampling another. Our vegetable garden experienced a lot of erosion to the mulch we had just put down to hold in water and cut back on the weeds. But for the most part, the plants seem not to care. The tomatoes have all overgrown their cages at this point, and all have a plethora of tomatoes, most still green, but some harvestable, The watermelons have taken off, but most are still not large enough to take off the vine yet. The vines of the watermelons look a little rough, though. The weeds had overtaken most of our blueberry bushes, and the dwarf raspberry, and needed extricating. The cabbage looks rough – I doubt anything will come of this years run. The cucumbers are the most abundant thing in our garden, and resulted in an excellent sunomono late in the week. The herb garden is also doing well with the rain, and the asparagus looks quite strong and healthy. The leeks could stand a little more girth before harvesting, but they are doing well. And our muscadines (still in need of a finished trellis system) are doing well. One of them actually has quite a few dime sized grapes. Didn’t expect to get any fruit this year! But glad to know the plant is healthy. The other 2 vines have one or 2 small fruits; this is more in line with my expectations. Before I could get to status-checking my current batches, we made a family trip to The Happy Berry. Yesterday morning was a wonderful day for it; it was overcast, but not raining. It was still pretty humid, but much cooler than any other time I have been there. We hauled 6 pounds of blackberries and another 11 3/4 pounds of blueberries. Kim ended up going back in the afternoon with her sister and hauling even more berries! Returning home, I set to preparing a number of single gallon batches. First was the gallon of blackberry. I started by boiling 2 1/4 pounds of white sugar with 3 3/4 quarts of water (enough for a 1 gallon batch). I sorted, picked through and bagged 4 pounds of blackberries while this was heating, and then hand-crushed within a the bag, placed in a primary fermentation bucket. Once the water was heated, I poured it on the fruit bag in the bucket, and added 1 tsp. ascorbic acid and 1 tsp. of yeast nutrient. The recipe actually called for 2 tsp. of acid blend. I don’t have that, but didn’t think it appropriate to replace the whole quantity with ascorbic acid. I then left this to cool, in order to add the potassium metabisulfite. Second was a gallon of blueberry wine. I boiled 2 1/2 pounds of sugar in 3 3/4 quarts of water (a little more sugar than for the blackberry wine). I hand-crushed blueberries in a bag placed within a primary fermentation bucket. Once the sugar-water was heated, I added it to the fermentation bucket, along with 1 tsp. ascorbic acid (same explanation as above), 1/8 tsp. of wine tannin, and 1 tsp. yeast nutrient. Just as with the blackberry wine, I left it to cool so that I could add the potassium metabisulfite. Then, I began a gallon of blueberry melomel. I measured out 3 pounds of honey in a boiling pan, then poured as much of the honey as possible into a fermentation bucket. To the pan I added the 3 3/4 quarts of water, and brought it to a boil. While boiling, I crushed the blueberries as in the previous batch. Once the water was ready, I poured it on top of the honey and fruit in the bucket, and added 1 tsp. ascorbic acid, 1/4 tsp. wine tannin and 1 tsp. yeast nutrient. This was a big departure from the recipe by Terry Garey, which called for boiling the honey. I am following Ken Schramm, who questions the value in boiling honey, and the possibility of losing some of the great taste and health benefits it offers to the heat. Finally, I put together a gallon sweet cherry (specifically, Bing) wine. This was fruit I had already purchased earlier in the week (not a lot of U-pick selection for cherries in the upstate). As with the other recipes, I began by putting sugar and water to boil (2 pounds of sugar and 3 3/4 quarts water). I halved about 4 pounds of cherries, and I did not get rid of the pits (I tried best not to cut them, of course). I then attempted to crush them in a bag, but the bag broke (even after sewing a hole I had seen). Not having another bag (I had already used three), I just left the cherries without one. Oh, well. In any case, I then proceeded to hand-crush the cherries to a pulp. Once the water was ready, I added the 1 tsp. ascorbic acid, 1/4 tsp. wine tannin and tsp. of yeast nutrient. Later in the evening I happened to pick up 1 lemon at the grocery store, and I juiced and zested it into the batch, as well. The recipe had offered 2 lemons treated so in place of the acid blend. Since I had already used 1 tsp. of ascorbic acid, I halved the suggestion. Should be fine, I think. As with the other batches, I left it to cool so that I could add the dose of metabisulfite. Kim, on her way back from the second trip to the farm, found they had peaches for $0.80/lb. So she got a bunch for me to make wine, some for jelly or jam, and then a bunch for eating. Will have to get that started soon! Of course, we still have quite a bunch of berries not used for wine. Some of the blueberries will become preserves, I think. The rest will end up as fruit smoothies this winter. Kim loves to freeze them for keeping! Similarly, the blackberries left will have some frozen, but some of the others will likely become a cobbler soon. And this morning, very early (~1:30AM), I added 1/20 tsp. (my “smidgen” spoon) of potassium metabisulfite to each of the new batches. That means I should have been able to add pectic enzyme to each early this afternoon. But we took the kids skating, so it was at 7 this evening, which means that I won’t be adding yeast till late tomorrow evening. Each bottle received 1/2 tsp. pectic enzyme. With the new batches in “wait” mode, I decided that it was time to check on the batches “in process”. We had been having AC issues right before leaving town, so I had brought everything downstairs where it was cooler. Luckily, we got the AC in working order before leaving, but I still had not moved everything back upstairs. I started by moving the single gallon batches upstairs. First was the honeysuckle mead/metheglin. The SG measured 1.004, same as last time it was measured (mid June!). So I racked it onto a 1/4 tsp. of potassium sorbate and a “smidgen” of potassium metabisulfite for bottling. I haven’t added any sweetening sugar yet – maybe no need. it is a decent flavor, though a little harsh, likely meaning it needs quite a bit of additional aging. The recipe suggest 9 to 12 months for herbal wines/meads. Then came the pineapple wine. I measured an SG of 0.093. That is a little lower than the last measurement of 0.095, but that was quite some time ago, and there is no visible activity now. I am going to prepare it for bottling. I racked it onto the same chemical combination as I did the honeysuckle. It is quite dry, and will need sugar before bottling. Lastly, I was able to process the star anise braggot. You may recall this is the one where I burnt some of the grain as I prepared the mash. The star anise version was a 1 gallon test of whether that flavor would overpower the burnt aftertaste; it does to some extent, though the result is quite like licorice, which I am not particularly fond of. It had a distinct layer of tan sediment at the bottom, of multiple inches. The layer was so large that it kept me from being able to take a good SG reading. I did rack into a 1.5L vodka bottle, and tested the flavor. As noted, the taste is quite licorice; too much star anise and/or too long on the star anise. I brought the rest upstairs, but have not yet had a chance to work with them. The strawberry melomel is still lightly bubbling, but I think it is time to put an end to that! The “hefty” braggot, and remaining of the “burnt” braggot, are still bubbling slightly as well, but I am more inclined to give them time. The sweet mead seems still, but I need to look more closely. So now it is time to sit back with a glass of “Extra Sweet” Peach-Strawberry wine, layed-down last year. Drier than expected, but tasty. A good evening to one and all! This entry was posted in Fermentation Log, Fruits and Vegetables, Jams and Jellies, news, Resources and tagged asparagus, blackberries, blueberries, braggot, brown ale, cucumber, honeysuckle, leeks, Mead, melomel, metheglin, pectic enzyme, pineapple, pomegranate, potassium metabisulfite, potassium sorbate, priming, raspberries, star anise, strawberry, tomatoes, watermelon, yeast nutrient. Bookmark the permalink.